TACAnowblog has hit 100,000 readers! Since April 2011, TACA has posted 90 different blogs from a variety of physicians, industry experts, parents and friends. This blog was launched with the singular goal of educating families and community about the latest autism news and information. 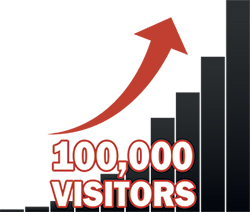 We are excited to know we have hit this milestone of 100,000 readers! Later this month, we will be moving the TACAblog to the TACAnow.org website (which has approximately 60,000-75,000 unique visitors every month.) This move will have some new and improved features that we look forward to sharing with our readers. 1) What do you want covered on the TACA blog? Share your thoughts in the comment section below. 2) Do you know someone that would benefit from being a regular reader of the TACA blog? Ask them to join our email subscription at www.tacanowblog.com! Thanks for reading! We have much more in store with the TACA blog. I want to read an article/letter from a kid on the spectrum!!! I want to see more about adult transitions from school to the real world. A lot of us are struggling with our young adults who still have communication, behavior and social issues that effect the types of programs and services that are available to them. I want to see it all come to an end. It is a manmade condition. Man can make it stop. It is the vaccines, according to Tom Verstraten, director of the CDC, Simpsonwood, Ga. meeting, June, 2000. All the higher officials who listened to his comments at that meeting and did nothing about it, including him, should be brought up on civil charges, fined and thrown in jail………..forever. These are crimes against humanity on the scale of the Nazi Holocaust.